A salmonella outbreak that sickened 60 people in six states has been linked to pre-cut melon, according to a release from the Centers for Disease Control and Prevention. People reported contracting salmonella after eating pre-cut melon between April 30 and May 28. At least 31 of those affected have been hospitalized. Salmonella is a very common cause of food poisoning. About 1.2 million people become sick each year in the U.S., with 23,000 people landing in the hospital and 450 people dying from the illness. This salmonella outbreak appears to have a high hospitalization rate, with over 50 percent of the affected patients hospitalized. Salmonella infections are especially dangerous in young children or elderly people. The FDA reports that in the current outbreak, the youngest infected is an infant and the oldest is 97 years old. According to reports, Michigan tops the list with 32 people sickened, followed by Indiana (11), Missouri (10), and Illinois (six). There is also one reported illness in Ohio. Most persons infected with salmonella develop symptoms within 12 to 72 hours after infection. Those symptoms often include fever, diarrhea, vomiting, and abdominal pain. The illness usually lasts 4 to 7 days and most persons recover without treatment. However, on rare occasions, the bacteria can cause arterial infections, endocarditis, and arthritis. The pre-cut melon responsible for the current outbreak has been traced to a Caito Foods, LLC facility in Indianapolis, Ind. 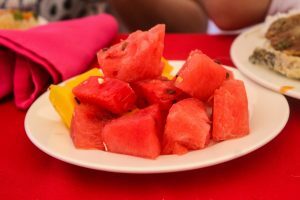 The company has now recalled its recalled its packages of pre-cut watermelon, honeydew melon, cantaloupe, and fresh-cut medley products containing these melons. The melon was sold in plastic clamshell containers at Costco, Jay C, Kroger, Payless Owen’s, Sprouts, Trader Joe’s, Walgreens, Walmart, and Whole Foods/Amazon. Consumers are urged to throw away pre-cut melon that fall within the recall. People should not eat the recalled cut melon or fruit salad products, the CDC said. If you don’t remember where you bought pre-cut melon, don’t eat it and throw it away. Consumers with questions about the recall can call 844-467-7278, Monday through Friday, 7 a.m. to 11 p.m., Eastern time, Saturday and Sunday, 7 a.m. to 7 p.m. Eastern time.